New Zealand’s Anna Richards will coach the Barbarians for their first two women's matches against international opponents. She takes charge of the Baa-baas for matches against the USA Women’s Eagles in Denver (April 26) and England at Twickenham (June 2). 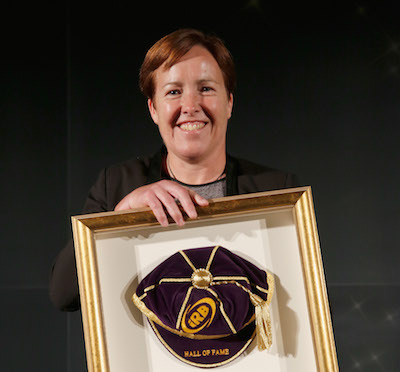 Richards is recognised as one of the game’s greatest players after making 49 appearances for the Black Ferns and winning four World Cups in an international career that ran from 1990 to 2010. She was inducted into the World Rugby Hall of Fame in 2014 and has coached in Hong Kong, Japan and New Zealand. She will be assisted for the USA game by Scotland’s most-capped player Donna Kennedy, who made 115 international appearances before launching a coaching career that has included five years in charge of Worcester. Richards takes over the role from Giselle Mather, who with Liza Burgess successfully launched the club’s women’s team with wins against Munster and the British Army in 2017-18. "Since I was first approached I’ve been so excited — the Barbarians really is the be all and end all,” said Richards. “When people think about who they’d like to play for it might be New Zealand or England or the Lions but the Barbarians is right up there because it’s such a historic part of rugby and because of the free style of play they stand for. “We’ll have quality players and I won’t need to tell them how to play the game! It’s about helping them express themselves and playing in the right spirit. “The USA will be an exciting team to play against next month. They’ve got a new coach in Rob Cain, finished fourth in the last World Cup and have great athletes — they’ll be very competitive." Barbarian FC chairman John Spencer said: “We’re delighted that outstanding individuals of the stature of Anna Richards and Donna Kennedy will be coaching the side against the USA next month.